Someone may soon be able to tell what types material are in your pockets from tens, and possibly thousands, of feet away. Using terahertz remote sensing, detectors could see through walls, clothing and packaging materials and immediately identify the unique terahertz waves of the materials contained inside, such as explosives or drugs. Until now, detecting terahertz waves - the portion of the electromagnetic spectrum between infrared and microwave light - hasn't been possible from distances more than inches because the waves are absorbed by ambient moisture in the air, killing the signal. "A lot of other researchers thought that terahertz remote sensing was mission impossible," said physicist Jingle Liu of Rensselaer Polytechnic Institute, lead author of the study published July 11 in Nature Photonics. Liu's team solved the problem by not relying on the terahertz waves themselves to generate or carry the signal back to the detector. Instead, they used the reflection created by lasers pointed at the target. The researchers have tested hundreds of different substances and created a library of terahertz spectra to compare to the signal from the target and instantly identify the material that was hit. The researchers demonstrated that they could detect the signal from 67 feet away, the length of their laboratory space, but theoretically they could identify materials hundreds of feet or even miles away, Liu said. "Homeland security and military agencies have been struggling for years to get technology like this," said terahertz expert Abul Azad at Los Alamos National Laboratory. "I think the approach they have revealed is really, really unique." The first application of this technology will likely be for the remote detection of roadside bombs, also known as improvised explosive devices (IEDs) by the military. Homeland Security and the Defense Department were the primary funders of the research. Terahertz detectors could also be used for airport security to detect illegal substances hidden in people's clothes. The approach would be less invasive than x-rays, Liu said, because terahertz waves are much lower in energy. It would not reveal anything concealed inside the body, because the terahertz signals cannot go through water, or metal. Theoretically, Liu said, terahertz remote sensing could also be used identify the composition of an unknown toxic spill in the environment, or the composition of objects in space. 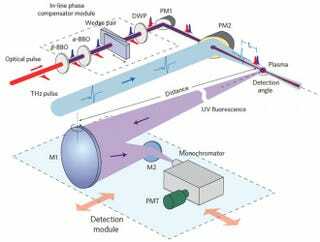 Image: 1) Schematic of the terahertz wave remote sensing technique/Liu. 2) Wikipedia/Tatoute.